"In Canada if you want to retrieve the family silver you send out a Mountie, here in Scotland you send for a Bobbie. In Inverness last Friday at the end of the 43rd Highland Week of International Curling it was not one but three Scottish Bobbies, not in blue but tartan, who clamped the Macallan Johnstone trophy in irons and safely delivered it home to Scotland after its two year absence spent in Switzerland and America. 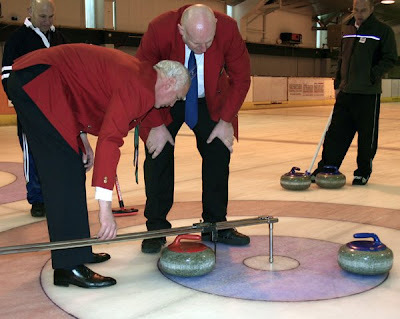 Retired Strathclyde police officer Gordon Gilchrist (Hamilton), with two serving policewomen, Kirsty Harrison (Stranraer) and Mel Porter (Kinross), and civilian fourth member Kevin Thomson (Kirkcaldy), burst open the resistance of the Canadian rink from Toronto of Scott and Connie Brown and Lindsay and Sherry Manery with a final salvo of seven stones over the closing ends to win 12-4 in the final of the Macallan Trophy. With the high road Glenfarclas Quaich also two years in exile it was guaranteed to complete the Homecoming when two Scottish rinks lined up in the final, Craig Hamilton (Aberdeen) and Gavin Nicol (Forres). Because of other commitments both skips had to call in substitutes for their final game. Hamilton was left with Tom MacGregor and Andrew Clark and looked to be on a winner when he enlisted former Quaich holder from 1995, Graham Kerr (Nairn), to deputise for Jim Goldie. Against Kerr's pedigree Nicol enlisted the local knowledge of Ice Rink Manager Keith Petrie to help out Jim Thomson and Mike MacDonald for the absent Andrew Cameron. The result was decided on two measures. Hamilton won the measure for two shots in the tenth end to force an extra, and Nicol's last stone in the eleventh for a winning 10-9 was decided on a measure." Top: the Warrior Scots, Kevin Thomson (left) and skip Gordon Gilchrist. Above: the deciding measure in the extra end. Back Keith Petrie and Gavin Nicol. Measuring are Abby Duncan and Alan Durno. 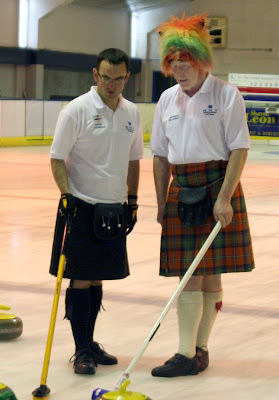 A fuller report on the week, with pics of the winning teams will be in the April Scottish Curler. Yet again HWIC was absolutely outstanding. We were delighted to have won the Alan Johnstone Trophy sponsored by Macallan. Winning 8 out of 9 games and only being beaten by the winners of the Glenfarclas Quaich was certainly an acheivement as Kirsty Gordon and Mel dont normally curl with each other, in fact are opposing teams. Congratulations to Gav Nicol and his team, and condolences to Bomer and the boys. Thanks to our sponsor WMT (www.wmtmarine.com) for our clothes. Photos will be added to their site soon. See you all next year at HWIC.